• Terry Rouse, shuttle location mgr. Aeration system …. Safe-Grain Inc.
Bin sweeps …….. Springland Mfg., Sudenga Industries Inc.
Catwalks …. LeMar Industries Inc. Concrete supplier ……… Mulford Concrete Inc. Concrete tanks …. Hoffmann Inc. Elevator buckets …….. Tapco Inc.
Millwright ……. TCR Systems Inc.
Rail construction ……. Ameritrack Railroad Contractors Inc.
Sampler …………. Gamet Mfg. Co.
Scalper ………. Baasch & Sons Inc.
Truck probe …… Gamet Mfg. 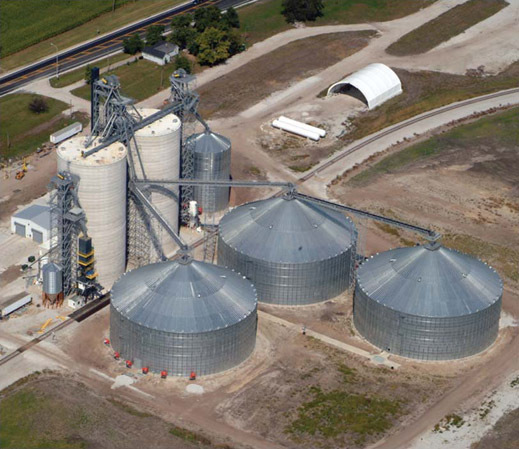 Co.
Western Grain Marketing LLC’s new 4.6-million bushel rail terminal north of Adair, IL, is designed to load 110-car shuttle trains on the Burlington Northern Santa Fe. Aerial photos by B&M Studio of Photography, Pekin, IL. 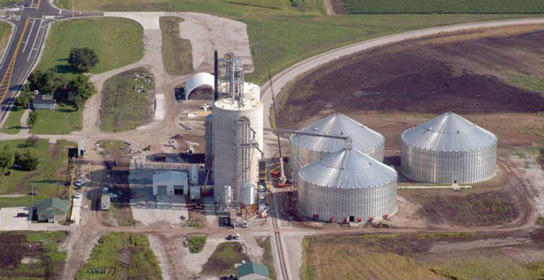 As with many very large projects, Western Grain Marketing LLC’s new 4.6-mil-lion-bushel rail loading terminal near Adair, IL (309-653-2650), was the result of a business study. Under the circumstances, the best strategy appeared to be finding additional markets for member producers. Rail, particularly the Burlington Northern Santa Fe (BNSF) could provide access to feed keting. High-altitude view of the Western Grain Marketing property showing a 7,690-foot loop track for continuous rail loading without decoupling. In 2008, the grain operation of Two in Rushville (217-322-3306). Rivers FS joined with its parent, The addition of a rail terminal al-GROWMARK, and the grain depart-lows the new operation access to river, ments of two other affiliated coopera-rail, and truck-to-processor markets, tives – Riverland FS and West Cen-whatever works out the best for memtral FS – to form Western Grain Mar-ber producers. 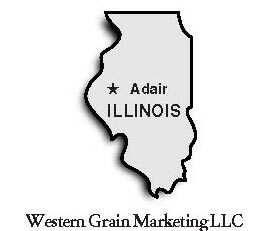 Western Grain Marketing purchased a 150-acre site near the center of its grain origination territory, at the intersection of U.S Highway 136 and State Highway 41, two miles north of Adair. 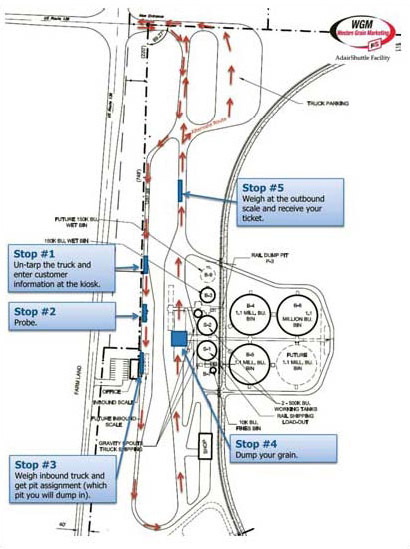 The site offers access to a BNSF main line, and Miller notes that the proposed extension of the State Highway 336 four-lane between Quincy, IL and Peoria, IL will have an interchange 2-1/2 miles north of the facility. CompuWeigh bulk weigh loadout scale is designed to load a shuttle train, under normal conditions, in less than 10 hours. Ground level photos by Ed Zdrojewski. • Laverdiere Construction Inc.,Macomb, IL (309-837-1258), prepared the railbed and Ameritrack Railroad Contractors Inc., Frankfort, IN (765-659-2111), constructed the 7,690-foot loop track from 132-lb. rail and wood ties. • TCR Systems Inc., Decatur, IL (217-877-5622), served as the project’s millwright. • KDJ Sales & Service Inc., Macki-naw, IL (309-359-3611), served as electrical contractor and installed the facility’s PLC-based control system. • Hoffmann Inc., Muscatine, IA (563-263-4733), constructed the terminal’s two 500,000-bushel jumpform concrete tanks. 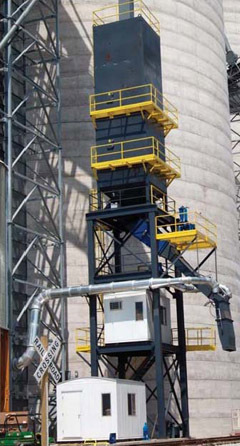 LP-gas Zimmerman tower dryer has the capacity to dry 5,000 bph of grain at five points of moisture removal. • Cross Country Construction, El-bow Lake, MN (218-770-2290), constructed the facility’s steel storage, including three huge Chief Titan 1.1-million-bushel tanks. • Mulford Concrete, Hampton, IA (641-456-5200), constructed concrete foundations. Construction began in the summer of 2008. The facility was expected to begin loading trains in September 2009. From left, dual enclosed mechanical receiving pits, two Hoffmann jumpform concrete tanks holding 500,000 bushels each, and between the tanks, two 20,000-bph Union Iron legs feeding two Union iron rotary distributors. Shuttle Location Manager Terry Rouse explains that Western Grain Marketing deliberately chose a mix of concrete and steel storage. With the projected loading of 90 trains per year, concrete was the choice for short- term storage, since it would have the strength to stand up to that many turns. For long-term storage with fewer turns, cost per bushel became the determining factor, so the company went with the largest steel tanks that were practical for the site. The two 500,000-bushel Hoffmann jumpform concrete tanks are 74 feet in diameter and 154 feet tall. These tanks have no sweep augers but are equipped with Bobcat doors for cleanout. Grain temperature is not monitored, but the tanks are aerated at 1/10 cfm per bushel with a pair of 40-hp Chicago Blower centrifugal fans per tank. The Chief Titan corrugated steel tanks, holding 1.1 million bushels each, stand 155 feet in diameter, 53 feet tall at the eaves, and 95 feet tall at the peaks. These flat-bottom tanks are outfitted with outside stiffeners and 16-inch Springland sweep augers. These also are aerated at 1/10 cfm per bushel, with six 20-hp Caldwell centrifugal fans per tank. Grain Handling Incoming truckers stop at a kiosk about 300 feet ahead of the scale to untarp and enter their truck information using an RFID tag reader. Following that, truckloads are sampled with a Gamet Apollo truck probe. While the sample is tested, the truck is weighed on an inbound 70foot pitless Rice Lake scale from Walz Scale located adjacent to the office building. After weighing, the driver proceeds to one of two side-by-side enclosed 1,000-bushel mechanical receiving pits. After dumping the load, the driver pulls onto an outbound scale and receives a scale ticket from a cab-high printer located next to the scale. The pits feed a pair of 20,000-bph Union Iron legs, which are outfitted with 20×8 Tapco CCHD heavy-duty buckets mounted on 22inch belts from All-States Industries. Each leg feeds a Union Iron eight-hole, 360-degree, double-inlet rotary distributor, which provides flexibility for each leg to deliver grain to either concrete storage, steel storage, loadout, or the drying complex. The operator has the option of running grain through a 40,000-bph Intersystems gravity cleaner.Then, overhead 35,000-bph Union Iron drag conveyors carry grain to its destination around the facility. The steel tanks empty onto below-ground 20,000-bph Hi Roller enclosed belt conveyors, which in turn, feed another 20,000-bph Hi Roller belt running back to the receiving pit area. From there, grain can be routed back into one of the receiving legs or a 50,000-bph Union Iron loadout leg. The loadout leg is outfitted with three rows of 18×8 Tapco CCHD heavy-duty buckets on a 60-inch belt. This leg also has twin 200-hp WEG motors with Dodge drives, allowing the leg to continue operating at reduced speed, if one of the motors is down for maintenance or repair. Train loading is accomplished with a 50,000-bph CompuWeigh bulk weigh loadout scale under the control of that company’s fully-automated GMS-SMART controls and RFID rail- car system. 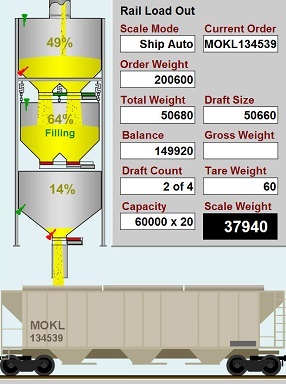 The bulkweigher also has a Gamet sampler for origin grades. The operator can run grain through a Baasch & Sons scalper prior to loadout to meet end user specifications. When completed, the loadout area will have a TCR Systems trol-ley-type lanyard system running approximately five railcar lengths. 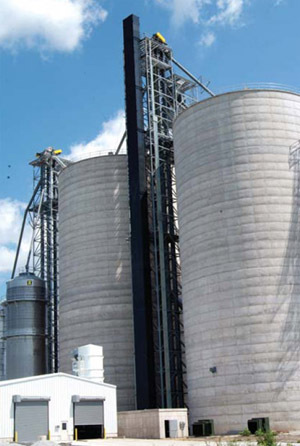 Wet grain can be routed to a 55-foot-diameter, 170,000-bushel Chief wet tank adjacent to an LP-fired 5,000-bph Zimmerman tower dryer. One of the two concrete tanks also can double as a wet tank. The dryer is served by 20,000-bph Union Iron wet and dry legs, which provides enough capacity to add a second dryer, if needed. Rouse says one person can operate the entire elevator from one of three locations – adjacent to the receiving pits, the loadout shed, and the main office.